2014 marked the 100th anniversary of the beginning of WW1, and BugBitten’s most read blog discusses the parasitic dangers that soldiers faced in the trenches. For example, Trench fever affected approximately half a million soldiers. This and other parasites were a result of poor and unhygienic living conditions. Parasitic outbreaks continue to be a ‘by-product’ of war today. The Aleppo Evil is the name given to the disfiguring subcutaneous leishmaniasis that has been on the rise since the start of the Syrian conflict. At BugBitten, we like to report on the latest outbreaks and health concerns, as they happen, but unlike other news outlets we also follow up on outbreaks even after they stop making the headlines. Vera Unwin first reported on the Zika outbreaks in Brazil at the beginning of 2016, and we have since reported on the progress of the outbreak. Look out for Krisztian Magori’s upcoming blog on where we are with Zika in October 2016. BugBitten also reports on those outbreaks that don’t make it on to mainstream news channels. Anja Choon works for the German Red Cross, and reported on the outbreak of Lassa fever in Nigeria. Christina Faust reported on the Yellow Fever outbreak in West Africa in July 2016. The outbreak is attributed to a combination of urbanisation and a shortage of vaccines. BugBitten’s bloggers work in the field and can give a personal insight on a subject. Ailie Robinson spent five weeks deployed in Sierra Leone during the Ebola outbreak. She was able to tell us about the challenges facing the teams working to control the outbreak. She says the hardest part of her deployment was at the end when she had to leave, even though there was still so much left to do. 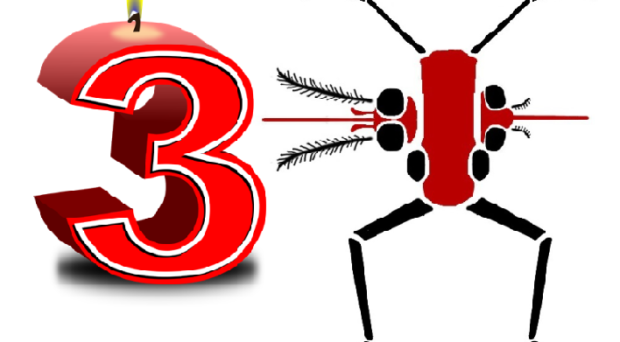 Malaria is a popular topic on Bugbitten with just about all our resident bloggers covering different aspects of the disease in their blogs. Lauren Cator, a mosquito biologist, joined BugBitten’s family of bloggers in the summer of 2015 and her recent blog on insecticide resistance hampering malaria control received many positive comments on social media for both its scientific content and its reference to Monty Python! Penguins are cute and nobody wants to see any harm come to them, but there have been several cases of these much-loved birds succumbing to malaria – a parasitic disease that they would never have come into contact with in their native habitats, but are exposed to in captivity in zoos. BugBitten’s Coordinating Editor, Professor Hilary Hurd, investigates why. Anouk Gouvras specialises in schistosomes at the Natural History Museum in London, and she has written several blogs on them for BugBitten. Her blog on the probiotic potential of helminths in fighting Crohn’s Disease made a splash in the media, with the blog post being shared 500 times on Facebook alone. Christmas is not immune to the BugBitten treatment, and our festive blogs have certainly made us look at the holiday period in a different light. Vera Unwin’s investigated how Rudolph might have got his red nose, Srimathy Sriskantharajah examined why mistletoe came to be an endeared parasite, Kevin Tyler asked us what is really in our Christmas dinners and Torleif Markussen Lunde told us what might be lurking in our Christmas trees. BugBitten launched in October 2013 and its popularity has increased rapidly in that time such that BugBitten’s blogs are viewed by over 7000 readers a month. The popularity of the blog is due entirely to the high calibre of writing from our resident bloggers and our guest bloggers alike. If you would like to join the BugBitten family, contact us via twitter – @bugbittentweets or email parasitesandvectors@biomedcentral.com. We would also like to hear from you as readers of the blogs too. You can comment directly on blog posts and also let us know via email or twitter what you would like to read more about on BugBitten.